Have you ever asked yourself....who would I be if I stopped living life based on a painful story ? Up until today has your personality been a composite of the limiting stories that still haunt you ? Have you wondered who you might be if this story was not defining your life any more? Born to engaged Civil rights advocates from Alabama, I noticed very early that people could achieve all their inalienable rights and still not be 'free.' All of us alive have 'enemies,' (unresolved stories/traumas) that dictate our true freedom and potential. My practice focuses on reestablishing freedom from the stories, fears, phobias, & self sabotage that until now have defined your ability to exceed and excel. All of us are Divinity wrapped in human fears and limitations. I believe it is your birthright to fulfill your passions & fully potentiate ! 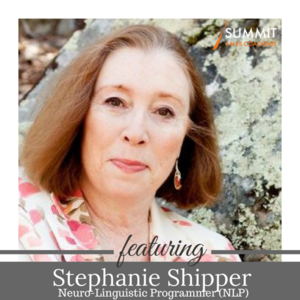 Stephanie Shipper has 33 years experience as a Certified Trainer of Neuro-linguistic Programming (NLP,) a Trainer of Touch for Health Kinesiology & Consulting Kinesiologist, IAKP, a Certified Practitioner of both Integral Eye Movement Therapy, IEMT, and a Havening Practitioner. In addition to her therapeutic background...she has worked with clients such as the US Army Peacekeeping Forces, PSYOP Division, the NC Bar Association training Mediators, Live on NY (the NY Organ Donor Foundation,) and has been a top corporate speaker in Conflict Resolution/Negotiation for Vistage International for 16 years. It is my honor to serve you and make a difference in your life. I am available for both daytime and weekend hours. Stephanie Shipper reveals the dramatic results of her Traumatic Release Session with Havening. As you will see, tremendous resilience and a sense of empowerment are restored. During this video you will see, hear, and experience exactly how it works. I grew up as an empathic, sensitive, highly intelligent Jewish boy. My family were stoic second generation Holocaust survivors. Holocaust remembrance was a large part of my life. I was taught not to feel. As early as I can remember I have felt disconnected from a sense of self and my internal world and have been haunted by a sense of heaviness and impending disaster. This was confirmed and compounded by my time as a tank gunner in the Israeli army and during the Yom Kippur war of 1973 where I witnessed my buddy's death and lost many friends killed in action. I participated in 3 hours of Havening and after a whole life of feeling frozen, I am blessed now to feel a definite lightness and vitality. Other welcome changes include noticeable softening to my face, my bronchial tubes have expanded and my ability to socially engage have definitely improved. I recommend Havening to anyone ready to experience relief from significant trauma. Stephanie Shipper reveals the dramatic results of her Traumatic Release Session with Havening. As you will see, tremendous resilience and a sense of empowerment are restored.